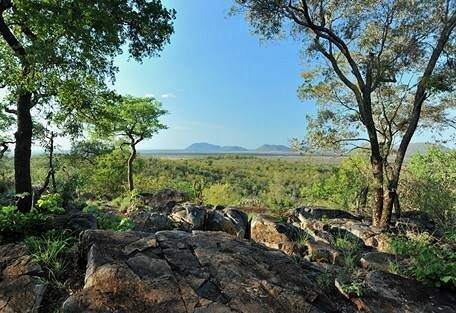 The Madikwe Game Reserve covers 750 sq km leading up to the Botswana border in the north of South Africa. 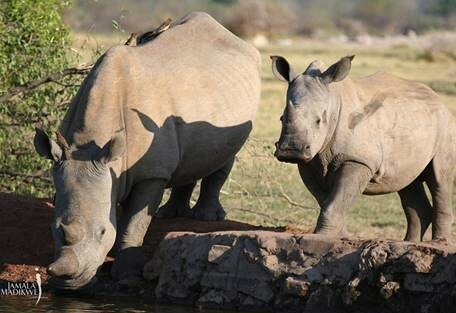 This Big 5 reserve lies in the Madikwe River basin and incorporates private farms. Aimed at conservation of the land, the people and the wildlife, all profits support the community. Madikwe was created in 1991 when poorly used farmland was transformed into a game reserve with the aim of benefitting the local community. This 750 sp km reserve lies in the north of South Africa, on the border with Botswana border in a malaria-free area. The reserve itself is surrounded by adjoining private game farms that are not separated by fences, but have private traversing rights. In the largest movement of animals since Noah filled his arc, the 75 000 hectare reserve - South Africa's 5th largest - was stocked with 10 000 head of game, comprising 27 different species. The park's very existence contributes to the preservation of local fauna and flora and rare animals such as rhino and wild dog, and also provides a more sustainable environment for the local people. Madikwe's location means that it lies in the transition zone with the Kalahari basin, the largest semi-desert in the world. 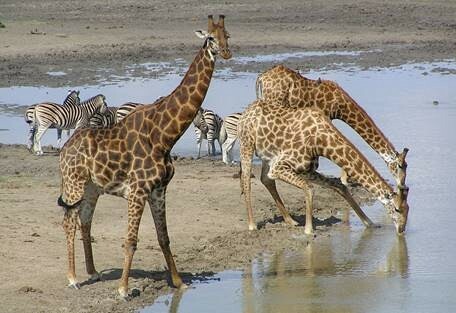 Species that occur naturally in the Kalahari can be spotted at Madikwe, giving it a unique appeal in South Africa. A game reintroduction programme, Operation Phoenix, is the largest game translocation exercise in the world. More than 8,000 animals of 28 species have so far been released into the reserve. This is a superb self-drive or fly-in destination in South Africa for families with children. Only 4 hours by road from Jo'burg and Pretoria, while it is situated on 75 000 ha next to Pilanesberg and near the Kruger Park. The winter months of May to September are best for wildlife viewing. During this dry time, vegetation thins and animals gathers around water sources, making them easier to spot. The Dwarsberg Mountain Range forms the southern boundary of the reserve, while an undulating vegetated plateau extends north until reaching an escarpment. This otherwise flat land is interrupted by the Tshwene Hills and peaking inselbergs. Motswiri Private Safari Lodge is a luxury lodge offering a secluded hideaway in the exclusive malaria-free Madikwe Game Reserve. 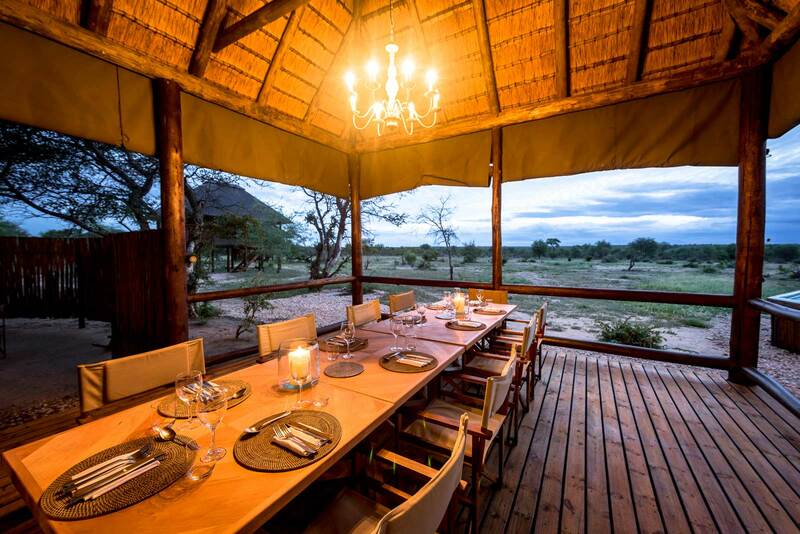 Guests can enjoy a personal and intimate safari experience with game viewing, gourmet cuisine and activities. Royal Madikwe Lodge offers a luxurious and exclusive safari experience in a private corner of the Madikwe Game Reserve; guests not only have a luxurious bush home, but a piece of Africa all to themselves. 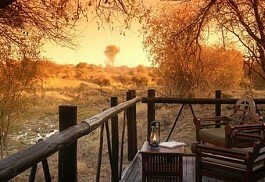 Madikwe Safari Lodge is located in one of South Africa’s largest sanctuaries and the reserve is malaria free. The area offers an abundance of wildlife as well as superb bird watching with over 350 bird species in the reserve. 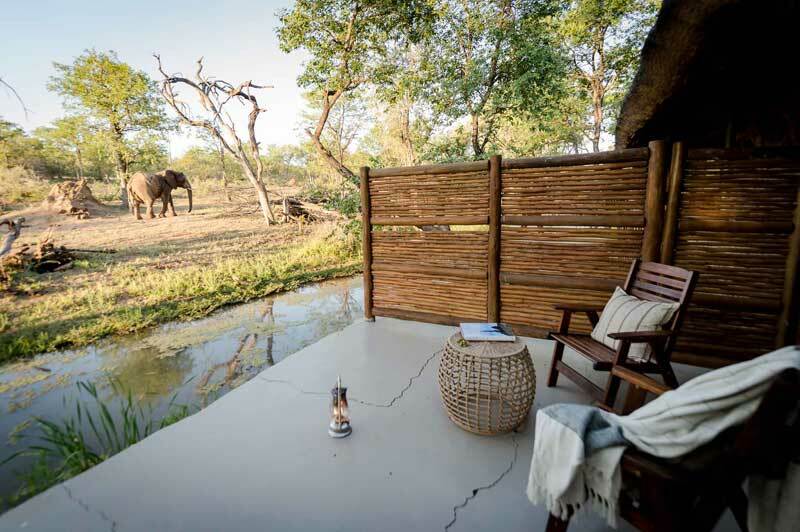 Morukuru Lodge offers visitors a personal and exclusive safari experience in the malaria-free 75 000 hectare Madikwe Game Reserve. The lodge offers only 3 luxurious en-suite bedrooms with king-size beds and air-conditioning. Madikwe Hills Private Game Lodge offers the ultimate in safari luxury; the fantastic team of staff at Madikwe Hills will ensure your safari experience is unique and one not soon forgotten. 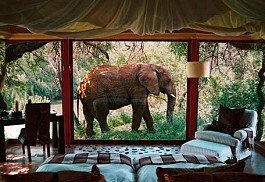 Guests are ensured of a personal and intimate safari and wildlife experience. 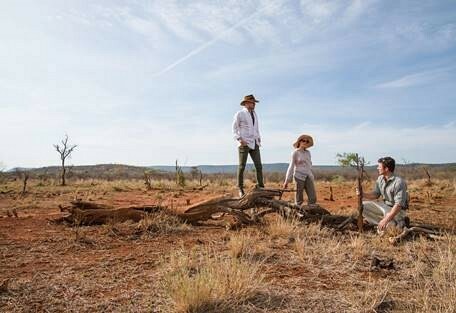 Panoramic views, exotic sounds and wild aromas of the bush are the essence of the Jamala Madikwe experience in the malaria-free Madikwe Game Reserve. Premier accommodation in 5 individual villas with a spectacular game, including African wild dog. 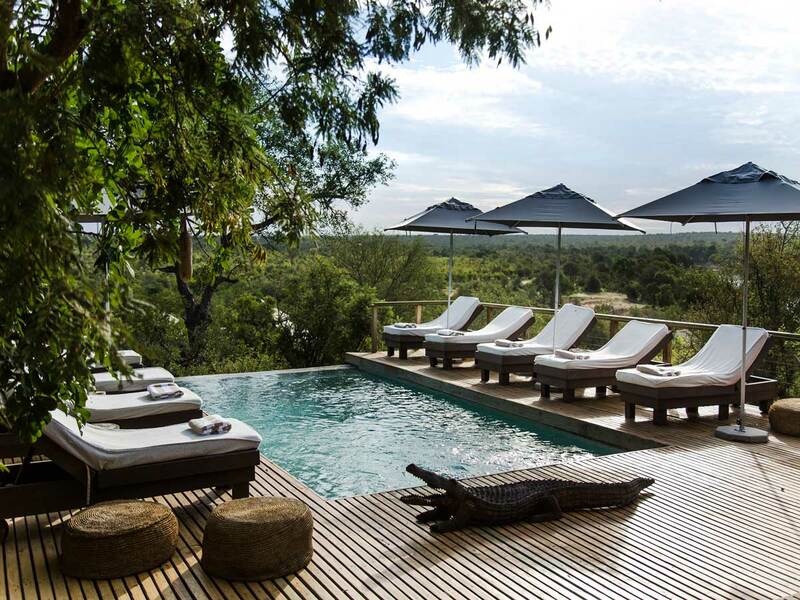 Sanctuary Makanyane Safari Lodge is an exclusive luxurious lodge in the malaria-free Madikwe Game Reserve, offering an exceptional safari experience! Excellent food, opulent suites and thrilling game viewing make for an unforgettable wildlife safari! Madikwe River Lodge is situated in the midst of the 75 000 hectares of malaria-free Madikwe Game Reserve on the Groot Marico River. 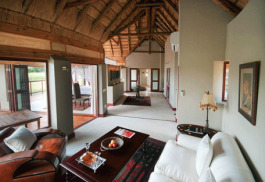 The lodge offers luxury and African charm in beautiful thatched chalets offering a tranquil retreat. 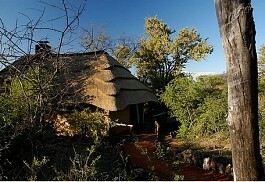 Jaci’s Safari Lodge is situated in the malaria-free Madikwe Game Reserve. 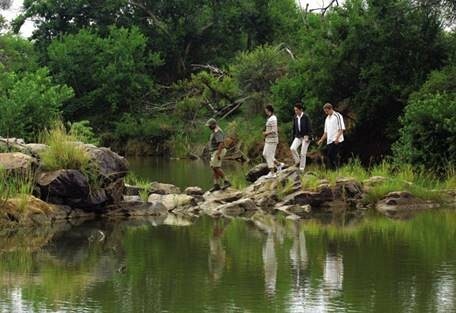 The lodge offers a unique and intimate safari experience and is privately owned and managed. Guests can expect to see wild dog, rhino, plains game, and over 340 species of bird. 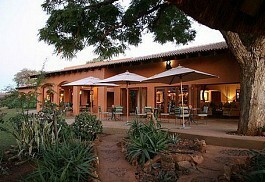 Buffalo Ridge Safari Lodge offers a peaceful location in the heart of the malaria-free Madikwe Game Reserve. Guests can enjoy luxurious accommodation with large viewing decks and fantastic game viewing opportunities in this enormous game reserve. 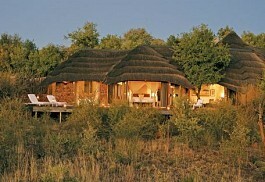 Rhulani Safari Lodge offers guests a superb Malaria-free Big Five safari experience in the Madikwe Game Reserve. The chalets are luxurious with en-suite bathrooms, indoor and outdoor showers as well as private plunge pools and spectacular views. 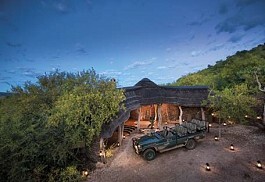 Tuningi Safari Lodge offers 5-star luxury in the world famous malaria-free Madikwe Game Reserve. Guests can enjoy a personal and exclusive safari experience in exclusive bush villas with beautiful bathrooms and outdoor rock showers. Thakadu River Camp is a luxurious tented safari camp overlooking the Marico River in the Madikwe Game Reserve offering beautiful views. 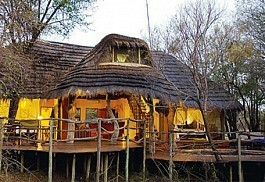 The camp is family-friendly, accommodation is luxurious and the safari tents have private viewing decks. 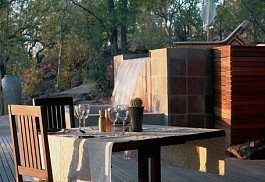 The Bush House is a warm, friendly and intimate game lodge situated in the malaria-free Madikwe Game Reserve. Accommodating in only six luxurious rooms, guests can enjoy a luxurious yet traditional safari experience in an area known for superb big five game viewing. 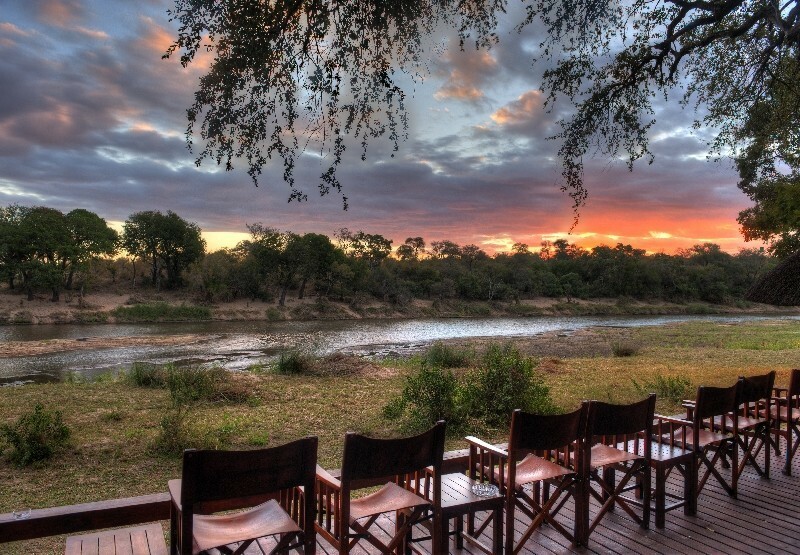 Etali Safari Lodge offers peace and tranquility in the game-rich Madikwe Game Reserve. The lodge offers the ultimate in bush luxury with eight luxurious air-conditioned safari suites offering complete privacy. 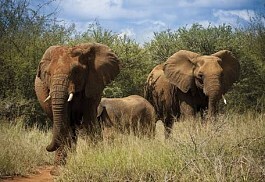 Not only does this reserve boast the Big 5, but it also has the Super 7. This adds cheetah and wild dog to the traditional five animals; leopard, lion, buffalo, elephant and rhino. These 2 added species are serious carnivores and they are both specialised in incredible ways. Both the cheetah and the wild dog are endangered species, putting these sightings high up on traveller's game spotting lists. Sable, eland, gemsbok, giraffe, hippo, zebra, wildebeest and large herds of plains game add to the plethora of animals residing in this reserve. Species specialised for a semi-arid environment, such as the brown hyena, African wild cat, honey badger and bat-eared fox occur here naturally, due to Madikwe's morphing environment with the Kalahari to the north. The game viewing appeal is enhanced by the astounding 350 species of bird that have been recorded in the area. 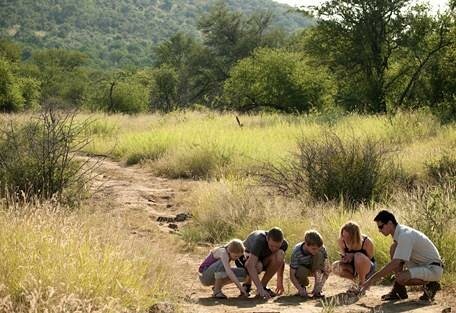 Activities guests can enjoy in Madikwe Game Reserve include morning and evening game drives in open safari vehicles, bush walks, bird watching, astronomy, village tours, bush breakfasts and dinners, health spa treatments and children's activities. 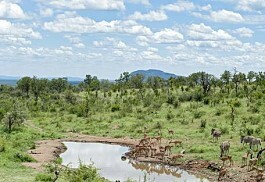 Madikwe Game Reserve experiences wet summers and dry winters. It rains from October to April with the highest rainfall expected between November and February. Daytime temperatures are hot and humid with an average of 31 degrees Celsius. The rains at time of year water the land and encourage rapid growth of beautiful greenery. Although lovely and lush, this is a difficult time of year for game viewing because the animals are hidden by the bush and spread out due to the abundance of water. The best time to go on safari in South Africa is during the dry season when the bush thins out and water becomes scarce, encouraging the wildlife to gather at the few permanent waterholes and rivers to drink. The dry season occurs during the winter months, from May to September, and bring with them fresh, clear air. The mornings can be particularly cold, dropping to 2 degrees Celsius, but by midday it is much more pleasant at around 22 degrees. Bundle up for morning and evening game drives! Madikwe Safari Lodge and Tuningi Safari Lodge are more luxurious options, and both offer superb wildlife experiences, combined with quality hosting and cuisine. 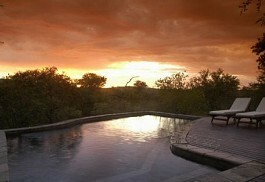 Jamala Madikwe offers premier accommodation in 5 individual villas with a spectacular views of the surrounding reserve. 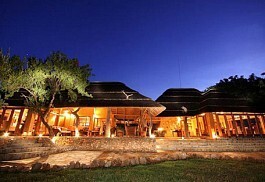 The lodge is designed with African elegance and opulent warmth. 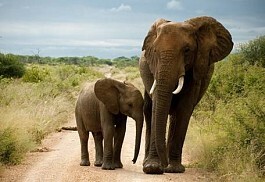 Due to Madikwe's location on the border of South Africa and Botswana, it can be accessed from within both countries. It is only 28km from Gaborone, Botswana's capital, and 360km from Johannesburg. Sun Safaris will book their guests on a direct flight from OR Tambo International Airport in Johannesburg to Madikwe Game Reserve - a flight that is scheduled twice a day, in the morning and the afternoon. 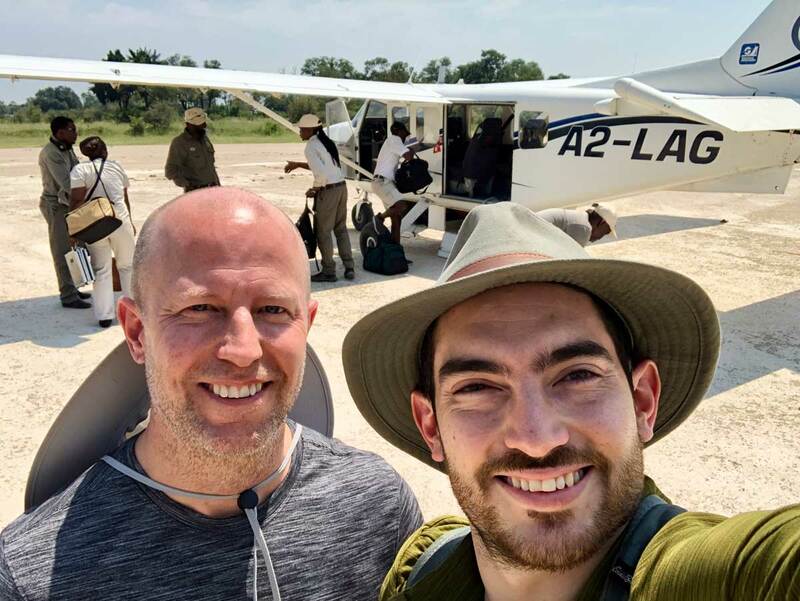 The flight only takes an hour and will deliver guests at the reserve airport, from where they will be picked up by their hosts from the lodge and driven then final leg to their booked accommodation. 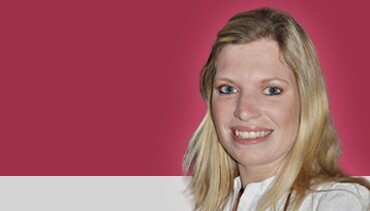 Alternatively, guests exploring South Africa via road can easily reach Madikwe in a rental car. It is set in the region a beautiful collection of reserves and wildlife areas, including the Kruger Park, and the drive will be pleasant. If guests are driving directly from OR Tambo Airport, it will take them roughly 4 hours, depending on how often they stop to admire the scenery!